Russian President Vladimir Putin on Thursday called for cooperation between Washington and Moscow on Syria and beyond, saying it is now a crucial moment in East-West relations not unlike the end of the Cold War, the New York Times reported. Putin said he hoped the beginning of such cooperation would emerge from talks in Vienna on Friday between the foreign ministers of Russia, Turkey and Saudi Arabia as well as the U.S. Secretary of State John Kerry. Putin made his remarks in Sochi at Valdai Discussion Club, an annual gathering of Russian experts, sharing the stage with regional figures, including Ali Larijani, Iran’s speaker of Majlis. Putin added the Syrian President Bashar al-Assad, who visited him in Moscow earlier in the week, was willing to make a common cause with the armed opponents, as long as they were willing to fight the Islamic State. “I will pull back the curtain a little on my talks with President Assad,” Putin said, adding that he had proposed providing Russian support to armed opposition groups in Syria that are willing to fight the Islamic State. Putin as well as Larijani in their speeches rejected proposals for Syria’s partition, calling them a formula for endless warfare and dangerous gains by the militants. 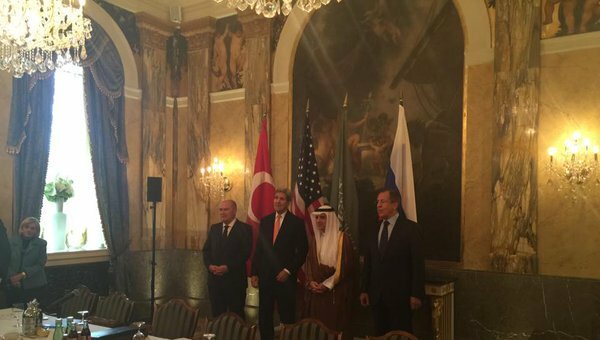 UPDATE: The foreign ministers of the United States, Russia, Saudi Arabia and Turkey met on Friday in Vienna to put forward new ideas for a political transition in Syria. They agreed to meet again next week in an expanded format, which could include foreign ministers from Iran and other regional countries. Why the hell wasn't Iran invited? Putin probably wants to make sure that the whole world knows, including the Iranians, that he's the new master in Syria. In next week's meeting, however, Iran, Qatar and Jordan will most probably be invited too. Just yesterday Russia said there is no prospect for a solution in Syria without Iran. You really think he's trying to send that kind of message? Maybe the Saudis didn't want their foreign minister meeting Iran's is all. Besides, even if Putin is providing air support, Iran has troops on the ground and controls the pro-government militias, including Hezbollah. Iranians play a major role on the ground; the current battle for Aleppo for example is led by Iranian generals. They brought in the Hezbollah and Afghan and Pakistani and other foreign Shia militia to fight on Assad's side. The Iranians also support the regime financially. Naturally any political settlement of the conflict would require Iran's full participation. The Russians, however, are now playing the leading role in Syria. Kremlin is the place Assad goes for his first foreign trip since the conflict began in 2011. As important as Soleimani's role is in Syria, he now has to play second fiddle to the Russians. Russia and Iran have a lot of common interests in Syria; propping up Assad for one. But they have long-term strategic differences too. Russians want to strengthen the Syrian Army to lead the fight. They don't care much about militias, either Syria's own NDF, or Iran-backed Hezbollah and foreign Shia militias. As matter of fact they fear their prominent role eventually weakens the Syrian Army and its central government, and might lead to disintegration of Syria. Russians are after a strong secular government, not the Shia/Alawi fight against the Sunnis. Saudis will accept Iran's participation in the process, their hands is tied in Yemen. Their foreign minister and Zarif will most probably be in the same room next Friday in Vienna. Sorry for long reply, but wanted to give you my take on this very complicated conflict. 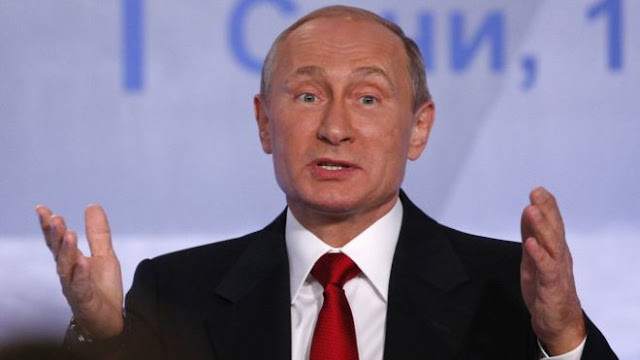 The Russians are now stating Iran and Egypt should be involved in the political settlement. I believe that's a great idea. Saudi Arabia and Egypt will represent the two political poles in the Arab world. Iran and Turkey represent the two non-Arab Muslim nations. Those four plus U.S. and Russia, and probably the other three permanent members of UNSC, could form a P5+1-type body to handle all three regional conflicts, Syria, Iraq and Yemen. I thought it was Soleimani who convinced the Russians to provide air support for Iranian and Syrian forces when he traveled to Moscow before the airstrikes began, now I hear he has to play second fiddle to the Russians? Besides, which is more crucial to the Assad regime's survival? Air strikes or ground operations? I think Iran is still doing the harder part. I don't think Iran and Russia can even afford to compete over Syria today because their ally is barely holding it together. Maybe in the future they will, but everything that is being said about that today is mere speculation. ONCE again Russia is showing its willingness to end the conflict unlike the US that has no road plan only tells the world Assad is falling and the war drags on with people dying !.IT IS wrong for the US to usurp the role of the UN !!. SURELY this world is in urgent need of a True UN !!. Two different things are being discussed here. First, the common interests of Iran, Russia and Syria, as said above. Both Syrians and Iranians needed Russian help, as their offensive had somewhat stalled and loss of Latakia was becoming a possibility and something they couldn't afford. The new coalition would work together to at least save Latakia and western Syria. Second, the inter political dynamics between and among Iran, Syria and Russia. Regardless of what you and I think, there are different long-term strategies at play here, Russia's and Iran's are not the same. Russia's is establishment of a secular central government over all Syria, Iran's is preservation of Alawi/Shia-dominated government at least over western Syria. In the meantime, you and I can agree to disagree on our analysis and understanding of this very dynamic conflict. B.M.A., your anti-American ideology can never allow you to stick with facts, always seeing the need to resort to sloganeering. P5+1 was a body set up among the five members of the UNSC and Iran to resolve the Iranian nuclear issue, with Iran and U.S. playing the leading role, and the efforts succeeded, and the two sides struck a deal and avoided more tension and possibly war over the issue. And that was just last month. But that settlement worked so hard by the Iranian and American foreign ministers, so much so that they probably deserved Noble Peace, runs against your ideology, doesn't it? Now the discussion above, in Mark's comments and my response, has been about the formation of a P5+1-type body to resolve the issues of the three main conflicts in the region. Regarding he Syrian conflict, Mark said the Russians want full participation of Iran and Egypt, in addition to Turkey and Saudi Arabia, which were represented in the meeting yesterday, and the U.S. and Russia. I agreed that would be a great idea; and probably better to add the other three permanent members of UNSC to the mix, forming a P5+1-type body to work on Syria, and hopefully also on Iraq and Yemen, to end these three conflicts. I hope your ideology notwithstanding, you would agree that such arrangement is a good idea and can potentially bring peace back to the region. I've been discussing the strategic dimensions above and beyond tactical considerations. In short term, they are on the same page, as I have stated above, but not necessarily on long term, and that's where their strategies are different. A secular government ruling over all Syria needs by definition to be accepted by the opposition, like the Free Syrian Army, as well as the current government. So we are not talking about the resurrection of pre-revolution Assad dictatorship, which you refer to as deep state. Sorry to disappoint you, but that's a construct good for history books now. if there is anyone deserving the Nobel peace prize then it is you !,You have been singing and diligently shouting for a permanent solution for Syria for all these Years preferring a Government of National unity ,-BUT like the proverbial cry of a fish[in the water] no one notices is what noble voices like you do in this world. Now what makes you think that it is time to end the war , are you driven by an ideology > of cause not, but your human understand of conflicts moves you to yearn for an end to was not only in Syria but Yemen. NOW have ever seen a UN anywhere in this world?- The entity took a hibernation ! !- is the UN a body that knows its job description ?-HOW possible in this world mere individuals like USKOWI realize that an urgent solution is needed in Syria and yet the world only hears a deafening silence from the global body !. WELL the B.O.D realy good in military interventions but the world is yet see it resolve conflicts or give noble solutions to conflicts.IT has been years now the US supporting the Rats in Syria with training and all.But the worldl sees no end to the conflict.BUT Russia makes a military move complete with a SOLUTION to end the conflict!!. This is the reason the world believes that the US is usurping the role of the AND THAT ITS global peace machinations are not sincere !. Nader Uskowi, I'm not even sure we disagree on the fact that there probably are differences between Russian and Iranian long-term goals. On that you might be right. My only objection was to the notion that Putin truly thinks he can turn Iran into a second-class player at Syria. As I've said earlier and as you yourself have noted, Iran still has the overwhelming influence on the ground, its Shia militias (including Hezbollah, who's role in the war Russia has openly praised) are still indispensable and will probably remain indispensable to Assad's regime. So unless Putin has plans to deploy very large numbers of Russian troops at Syria and replace even Hezbollah, I don't see how Soleimani will play second fiddle to the Russians. "[This is one among the many reasons the world believes that the US is usurping the role of the UN and and silently cripples its activities ,compromises its role leaving it a toothless bulldog .And indeed there is much to believe that the US is not sincere in its global peace machinations]". When the equilibrium reached this is possible and now it has reached. With presence of Russia non of the hardliners on both side have a hope to win unilaterally and that is a good thing. Whoever idea was to bring in Russia was a clever and smart move and has to be applauded. Regardless of what Agenda Russia has for Syria (It has been so for the past 60 years) it is going to be a stabling factor. I just do not understand the fact that Russia with such deep roots in Syria, how could it let the Syrian problem get out of hand and reach such level. I mean what was Russia doing all the years of Libya, Tunisia, Egypt ...turmoil. Where they caught off guard or is it the bear hibernating or is it the fact that Russia wanted to show the world the true nature of the ME bigger plan and its failures and didn't want o step in before knowing the scope of the players in the conflict! I think the later is the answer. Had U,S, played a more assertive leadership role in this conflict , things would not have turned this awful.